Update 10/27/2009: Google Voice now supports adding voicemail to any old cell phone number without the “Do not disturb” trick. Simply go into ‘Settings’, Enter the ‘Phones’ tab and then click ‘Activate Google voicemail on this phone’. It will give you directions on call forwarding, which are the same as below, customized for your provider. Disable the “Do Not Disturb” setting to set your Google Voice account back to normal. Thank you Google! For those lucky enough to have a Google Voice account, you’ll know the advantages: forward calls to multiple phones, visual voicemail and audio to text transcriptions. But, since you are not yet able to transfer your current phone number to Google Voice, it is hard to give up your old phone number and start having family, friends and business associates use your new Google Voice number. Also, there is the whole confusion as to your outgoing caller ID, which won’t match if you switch to Google Voice. Some phone platforms have developed software that will integrate your current phone with Google Voice, while others have taken the opposite route of banning them (I’m talking to you, Apple and AT&T!). But, here is the good news: You can switch, at least your voicemail, to Google Voice on any provider and any phone, right now. Don’t have a Google Voice Account? Google is not yet handing out invites to the service, but you can sign up to be requested into the program here. To make this magic happen, we are going to utilize a feature that all cell phone networks, and even home phones, have – called “Call Forwarding”. This setting is used to tell the cell phone network what should happen when someone calls you in several situations: when your phone is off or otherwise unreachable, when it rings a certain amount of time with no answer, and when it is available but you are currently on another call. These situations are also known as “Conditional Forwarding”, and their names are: unreachable, not answered and busy. In your Google Voice settings, go down to the “Do Not Disturb” setting and check it off. This makes it so it does not ring out when the number is called, it will instead send any calls to your number directly into the voicemail box (and therefore have it transcribed and sent back to your cell phone number as a txt). 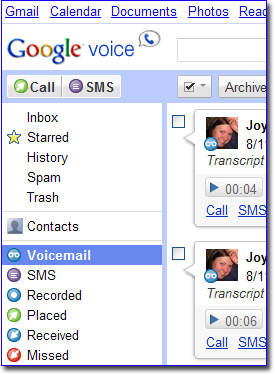 On your Google Voice homepage, you will see your number at the top left. Write/copy this down because you will use it shortly. The next step depends on which provider you use. Since Google Voice is currently United States only, I will only include call forwarding directions for major U.S. providers below. Include a “1” in front of the number to indication that it is a US Number you are calling to. How to use the chart below. Find your provider. Each provider has 2 numbers listed. Your phone may also have a shortcut designed to modify these numbers, if it has this feature feel free to use it. After typing the number, hit “send” to activate it. You should receive a message or tone that indicates your command was received. I do not have Sprint to confirm this, but from what I’ve read online, you need to call Sprint customer service, have them remove their voice mail package, and then ask the technical support representative to change the “Call Forward/Unavailable” and “Call Forward/No Answer” fields (and not Unconditional Call Forwarding) to your Google Voice number. For other providers, please contact or call technical support, and ask about “Conditional Call Forwarding” and check for any fees. After setting this up, all voicemails will now be directed to your Google Voice inbox. For even further integration, there are some options available, depending on your phone. If you have an iPhone check out GV Mobile, only available on Cydia, for excellent Google Voice/iPhone Integration. If you have an Android based phone try “GV” in the Android Market. Let me know your experiences with setting up Google Voice! Does it work well or would you recommend it to others? Great idea! I’m thinking about taking the Google Voice jump, especially for new business contacts, but was worried about attempting to get all of my friends to start calling my new number. The last thing I wanted was voicemails in TWO places.. This’ll be a great way to test the waters before taking the plunge. This is great, except that now you can’t use your google voice number the way it was intended to be used! An ideal solution would let calls from your old number go to Google Voice’s voicemail, but allow calls to the Google Voice number to come to your phone first. I don’t suppose this is currently possible? @Joe I agree – it does have some quirks to work out but it is a way to get it working, at least until there is a better way to do it. nice. Just got my google voice. It’s so much better than sprint, wish there was a way to swap voicemails and just kill my sprint one. I have TMobile prepaid and get a network error trying to do this. I also put the SIM in a basic phone and get the same error. BTW, does anyway know if this “conditional” forwarding is different from regular minutes? Regular forwarding consumes minutes, what about this? I have the very same problem like Irha (T-Mobile prepaid SIM) and I get the same error message. The carrier refuses to initiate the forwarding. Any news concerning this problem ? Or can anyone here confirm other US prepaid carriers where I can initiate this ? Any help is very welcome – thx! Great to know – thanks for confirming! Most providers make these minutes the same as normal minutes, but you might want to check with T-Mobile. Some may ‘double charge’ you since it is one incoming and one outgoing.